An Australian politician has told Sky News she stands by her stunt of wearing a burka in parliament despite facing a backlash. Senator Pauline Hanson has been widely condemned after wearing a full-length black burka as part of her campaign to have it banned. "We have a national security risk here, we need to address it," Ms Hanson said. "The burka is not accepted by the majority of Australians, they find it confronting and they don't want the burka." She claimed the garment was "not Australian" and that wearing it "is incompatible with our culture and our way of life". "If people want to live in a country wearing the full burka, which is not a religious requirement, then go back to an Islamic country where you can wear that," she said. 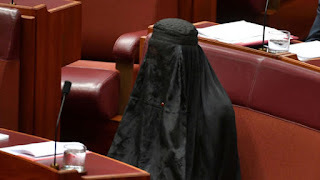 There are around half a million people of Islamic faith living in Australia and her call for a ban on the burka was met with a swift rebuttal from her fellow parliamentarians. The country's attorney-general, George Brandis, said the government had no plans to introduce a ban and criticised her actions. "To ridicule that community, to drive it into a corner, to mock its religious garments, is an appalling thing to do and I would ask you to reflect on what you have done," Mr Brandis said. Ms Hanson is the leader of Australia's One Nation party, which is anti-Muslim and anti-immigration. Speaking to Sky News, she claimed her identity was not checked before she went into parliament and said terrorists could use burkas to avoid detection. But her statement contradicts that of Australia's senate president, Stephen Parry, who said her identity was confirmed before she entered the chamber. Ms Hanson blamed political correctness for Australia's unwillingness to introduce a burka ban as, she claimed, many other countries around the world have already done. She also rejected claims her actions were a stunt to raise her profile and reinforce her reputation with her base in Queensland. "It was proving a point," she said. "It was lack of security." She said she had no problem with women wearing hijab as their faces were visible.